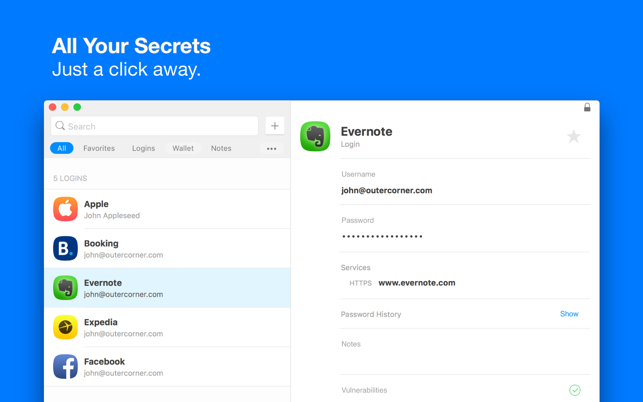 Secrets is a simple and secure password manager and secure wallet. Safely store your passwords, credit cards, bank details and more, using OpenPGP — a proven industry standard encryption format. • Store all your passwords, credit cards, bank details and other private information securely in one place. • Automatically fill logins on Safari or Chrome at a click of a button. No more copying and pasting! 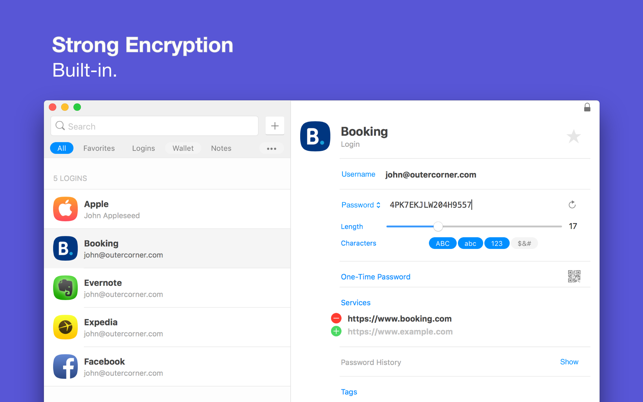 • Generate strong, secure passwords and enjoy the security of having unique passwords for all your logins. • Intelligent search helps you find your secrets quickly. 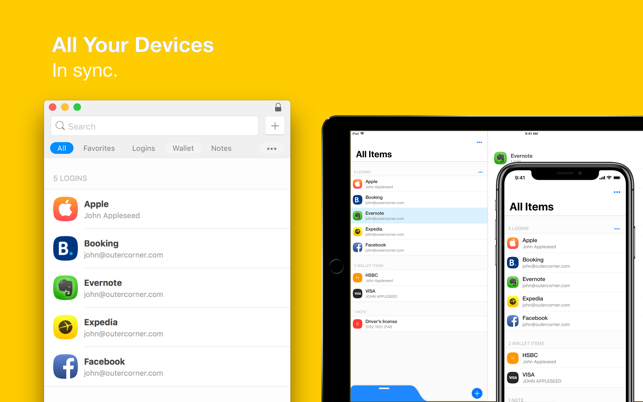 • Import passwords and other information from popular apps/services such as 1Password, LastPass, RapidoSerial and PasswordWallet. Or simply import from a generic CSV file. • Generate One-Time Passwords to login to services that support two-factor authentication. • Create and print a recovery key to unlock your data in case you forget your passphrase. • Your data is stored in the OpenPGP format — a time-tested and well known industry standard — and encrypted and signed with AES and RSA algorithms. • The Secrets app is the one and only app that decrypts and handles your data. There are no browser extensions or helper apps that can access your data. • Automatic locking keeps your secrets safe even if your device is lost or stolen. • Perform a security check on your logins to find weak, old or breached passwords. Go to https://outercorner.com/secrets/ for more information or to get in touch. Secrets is free to use with up to 10 items. The Premium In-App purchase unlocks unlimited items. • Safari extension has been rewritten to be more reliable. • One-Time Passwords are now copied automatically after auto-filling a Login. • Fixed various issues when running in full screen. • Fixed an issue that could cause sync to run indefinitely. • Implemented various minor enhancements. • Fixed an issued that prevented the launch of s3:// services using Transmit. • Fixed rare synchronization issue that could cause some changes to no be propagated correctly. • Fixed a crash that could happen when launching SFTP or SSH services. • Added support for directly launching Fetch.app to handle SFTP and FTP services. • Fixed a few UI issues when running in Dark Mode. • Added support for Mojave's Dark Mode. • Added support for Markdown in notes. • Added support for filling Logins in the Vivaldi browser. • Added support for Handoff. • Fixed many other compatibility issues with macOS Mojave. If something's not working for you, you have a suggestion or any other type of feedback, email us at secrets@outercorner.com. Enjoy using Secrets? Write a review! We love hearing from you, and it helps us makes Secrets even better. Thank you for using Secrets! Great app that syncs across devices. 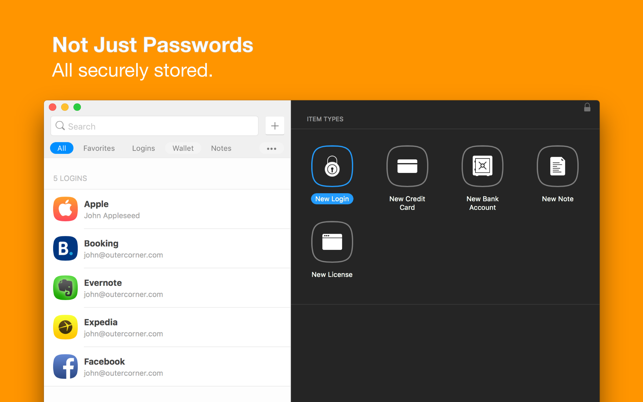 This app is great for keeping up with all of your passwords. I especially like that fact that it autogenerates passwords for you and also shows the past passwords you had before. The only thing that I wish they wouldn't do is charge you for iMac and mobile devices separately. Why not set it up as one package. Anyway, I've got more than my money's worth out of it. The only thing I would suggest is setting up a retreval process of the password you use to log into Secrets. My partner uses his fingerprint and he can't remember his password. Hello, thank you for your comments. Regarding the retrieval process, you can setup a recovery key with Secrets for Mac that allows you to recover your data if you ever forget you passphrase. You just need to print it and keep it somewhere safe. For those who say you can't categorize secrets, you can by adding tags and custom filters. More work, but still satisfactory solution for a MVP. Copyright © 2016-2019 Outer Corner. All rights reserved.